Furnishing a rented property with style. One of the main reasons that many of us tend to be in a hurry to try and buy somewhere is so that we can really make our mark on the property that we live in. Renting means living within the restrictions placed on the property by a landlord and that can feel very restrictive. Whether you’ve got a passion for colour or a very definite aesthetic that you want to create, sometimes renting can be frustrating. Plus, there’s the prospect of moving again, should the landlord decide to end the tenancy, so many renters are reluctant to invest in their current space in case they end up moving and having to start again. So, how do you make your house a stylish home when you’re renting? Work with the space that you have. If you’ve always wanted a standalone bath tub but your bathroom is the size of a postage stamp then don’t buy one anyway and turn the wettest room in the house into a cramped and stuffy space. If you have a passion for four poster beds but your bedroom is the wrong shape and won’t accommodate it, don’t try to move it in anyway. Instead, look at the space you have – perhaps even make a few sketches of it – and work out which rooms can accommodate what. Thanks to the likes of IKEA, Argos and vintage shops you will always be able to find something in the size and style you like. Buy a few statement pieces. You don’t have to compromise on the style when you’re renting and you don’t have to spend a fortune either. Slowly accumulate statement pieces – whether that’s art, furniture or crockery – that you really love and would be happy to take with you if you do move. Use these as the starting point for a design scheme – a 1950s coffee table for a retro vibe, an Art Deco sofa for traditional and classic, or an ultra modern industrial style stripped wood dining table if you have the space. Make the property your own. It’s important that the space feels like yours – that’s what you’re paying for after all – so including furnishings that mean something to you is important. 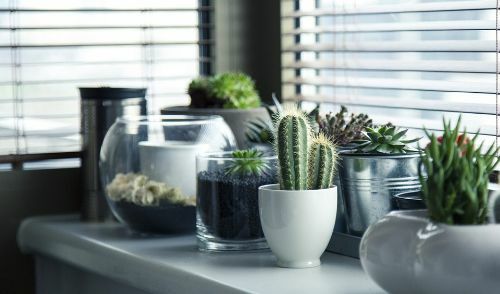 Whether that’s framed photos, ornaments, childhood books or pieces of china, your space will feel much more like a home if it has your things in it. The only word of caution here is: avoid clutter. There needs to be some order to the way you arrange everything or it will feel overcrowded and messy. Keep it consistent. The easiest way to decorate a rented property when you can’t wallpaper or paint is to just choose a simple colour scheme and go from there. Most rented homes these days have colour schemes of white and beige so you can take a single statement colour and add it to the room to give it your own personal touch. For example, you might have all your furniture in a dark wood with splash of shades of pink in the textiles. Or perhaps you’ll opt for Scandinavian style pale woods and primary colours on cushions, sofa and curtains. If you don’t like the furniture that’s already there then cover it – sofa covers, for example, don’t cost a lot to have made and will protect furniture too. These are just a few ways that you can make a rented property feel like a home, no matter where you are. When you start furnishing just bear in mind your damage deposit and don’t store any of the landlord’s furniture that you don’t want to use where it might get damp and mouldy and don’t throw anything away that is on the inventory (more information on inventories here) – otherwise, happy decorating!